Experience the life of a fighter pilot during this awesome Top Gun Flying Experience in West Sussex, where you will fly in the incredible Bulldog military aircraft. Often equipped with 7.62 mm machine guns and rockets and used by 10 different Air forces, the T67 Firefly is the ultimate fighter plane - and you will soon see precisely why! Once you have arrived and been welcomed to the centre at Goodwood Aerodrome, your day will begin with a thorough briefing covering all aspects of flying the T67 Firefly, including choosing your call-sign name badge for the day, all safety / parachute procedures, and how to fly aerobatics. Then it is time to get into the plane! Your flight will begin with a formation take-off (2 aircraft), followed by a demonstration and practice of aerobatic manoeuvres in these fantastically agile planes. After observing your instructor, it will be time for you to have a go yourself. The tricks you will be able to try include a tail-chase with the other aeroplanes and 'Chase the Bandit', before you return to base. Once you are back on land, you will finish your day with a full de-brief and a certificate (you can also purchase a video of your flight for £49), so you will never forget your Top Gun Flying Experience. 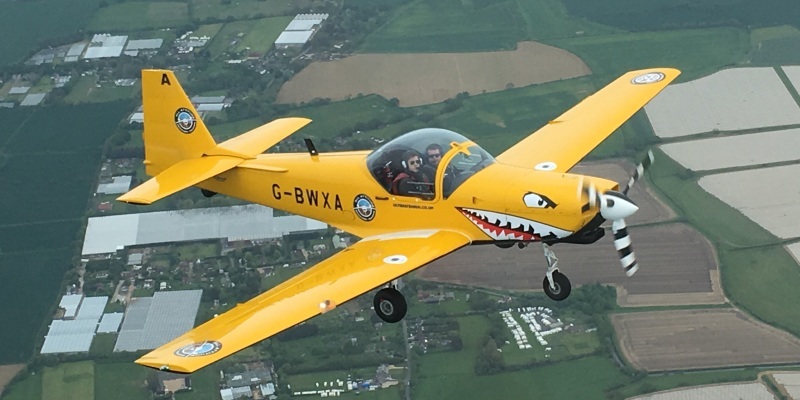 Sure to provide the adrenaline rush of a lifetime as you fly through the skies in the company of an ex-military instructor, the Top Gun Flying Experience is the perfect gift for plane enthusiasts, or those seeking a thrill in the skies. Saturday Missions for the Sussex Top Gun Experience for Two run all year round. The weight limit for the Top Gun Flying Experience is 17 stone. Height restrictions: Minimum height: 5ft. Maximum height: 6ft5"
Anyone aged 71 and over would require a doctors note. The Top Gun Flying Experience will have a total duration of 3-4 hours, with 40 minutes of flying time. Participants: The Sussex Top Gun Flying Experience for Two-Weekends is for 2 participants. You can bring a spectator along who will be looked after during the course of the day. Additional spectators are welcome, as there is an on-site cafe with a balcony to watch from. All equipment will be provided. Flat shoes and sensible clothing are essential. The Top Gun Flying Experience may be affected by weather conditions. Are you looking for an adrenaline-fuelled gift, that will reach new levels of excitement and thrill? 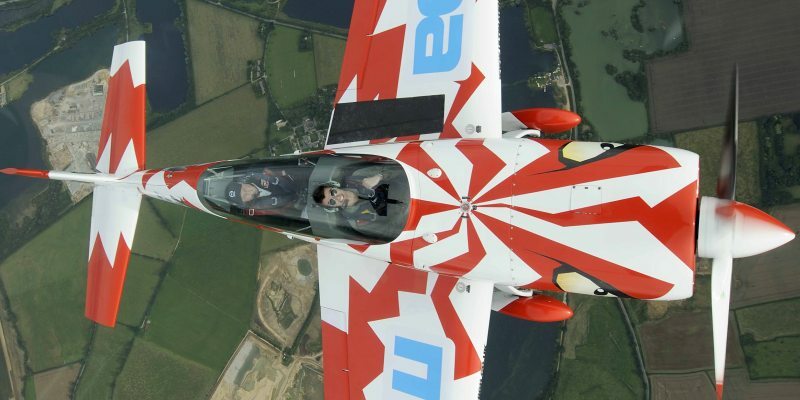 Ultimate High in Goodwood, Chichester, offers extreme aerobatic flying experiences and flights with professional fighter pilots – truly the ultimate high! 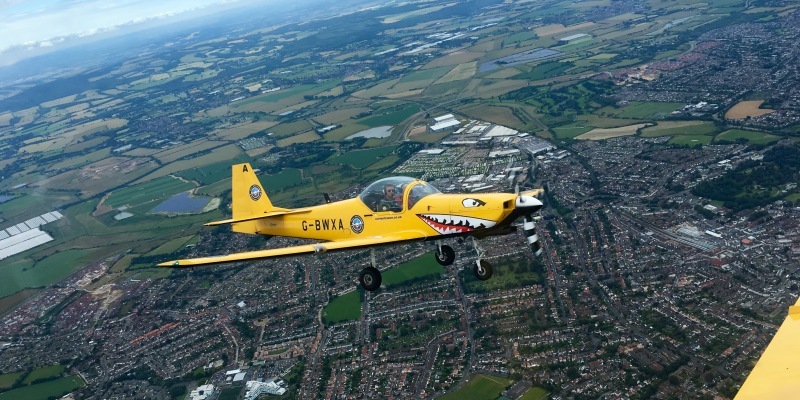 We interviewed Jo to find out more about these incredible flying experiences, and found out a lot of very interesting facts about their planes and celebrity visitors. Q1: We know that Ultimate High has a very fascinating history behind the planes, could you tell us more about this? Ultimate High operate 2 different types of aircraft. Our British built Slingsby Fireflies were used by the military as part of the process to train to prepare fighter pilots for the front line. Our flying guests sit side by side with their instructor and the bubble canopy allows fantastic visibility whichever way up the aeroplane is! Our tandem seat Extra 300 aircraft is a two-seat version of the aircraft used in the Red Bull Air Races and is used for public air displays. Celebrities who have flown with us include Guy Martin who learnt how to deal with G-forces for his wall of death world record attempt, the Stig, Reggie Yates, Steve Backshall, Carol Vorderman, Dr Alice Roberts, and we have featured on numerous TV programmes, including Strictly Come Dancing, Coast, Blue Peter and Fifth Gear. Q2: What differentiates your flying experiences to other competitors? We use extremely powerful aircraft that enable guests to derive first hand experience of flying on the edge. All of our instructors are ex-military professional instructors who love demonstrating the joys of aerobatic flight. We are the only place in Europe where you can fly simulated air combat in former military aircraft. We have also been awarded the title of “Best Adventure Experience” by the Gadget Show. Q3: What advice would you give anyone who hasn’t flown before or is a little apprehensive about a flying experience? Our experienced and considerate instructors always ensure that the flight is tailored specifically to the guest. Some guests choose to fly very gently whilst others are much more adventurous; we make sure that we always deliver exactly the right amount of excitement to each individual. Q4: In your opinion, what is the best part of your job? Introducing newcomers to the amazing experience of aerobatic flight and sharing their enjoyment and laughter. 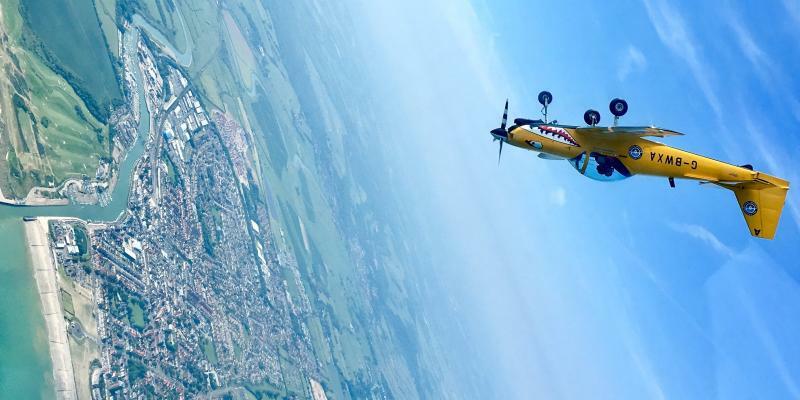 Q5: What type of aerobatic stunts do you do while flying? 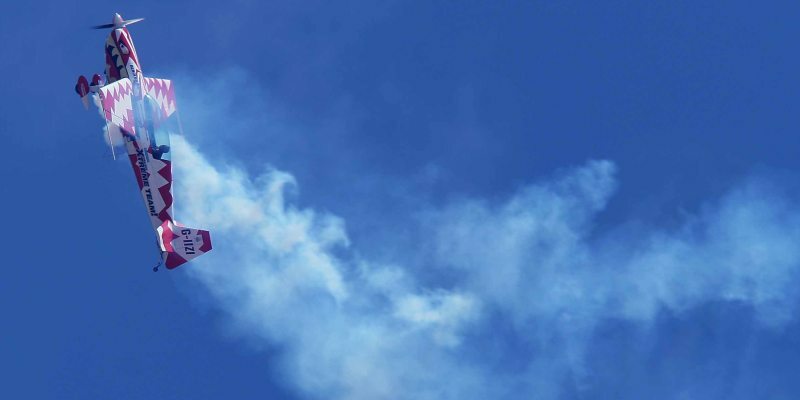 Aerobatic manoeuvres flown range from the most simple, such as loops and rolls, anywhere up to the extreme tumbling figures demonstrated at air shows. G-forces can range between +8G and -4G! Q6: Best Adventure Experience: What three words would you use to describe your flying experiences? Thank you very much to Jo for answering our questions about Ultimate High. It is amazing to hear about the history behind the former military aircrafts and how they are still being used today in such a remarkable way. 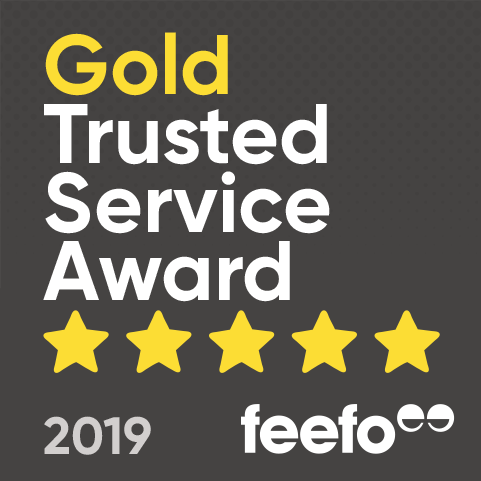 It really is no surprise that they received an award for the Best Adventure Experience! These flying experiences are the perfect gift for anyone with a head for heights and enjoys an action-packed activity.